Can't find a classroom and have a test. I'm in college and trying to find a math class that I've not gone to the entire year. The worst part is that I know there's a test that day. Forgotten locker combo. I don't ever remember being worried about my locker combo in high school, but apparently it's a big concern now. Ok, your turn. What's an oddball dream that you have often? 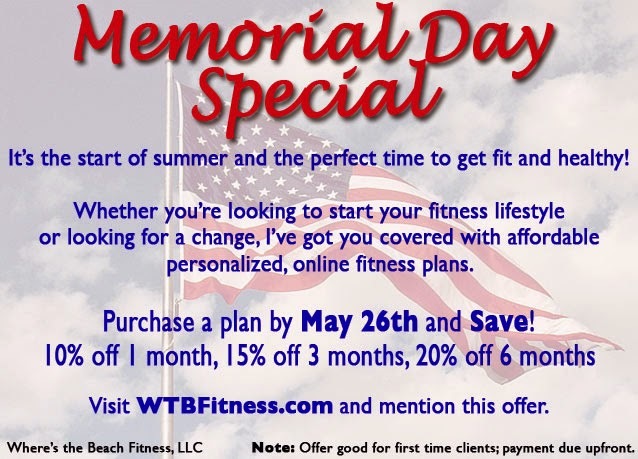 And, to celebrate Memorial Day, I'm offering up to 20% off personalized training plans at Where's the Beach Fitness.